This is a story about the fortitude a 10 year old boy shows in the face of adversity and how he comes to appreciate his family and friends more through it all. It should be a quick and exciting read for younger kids. This book was an Advanced Reading Copy, courtesy of NetGalley. 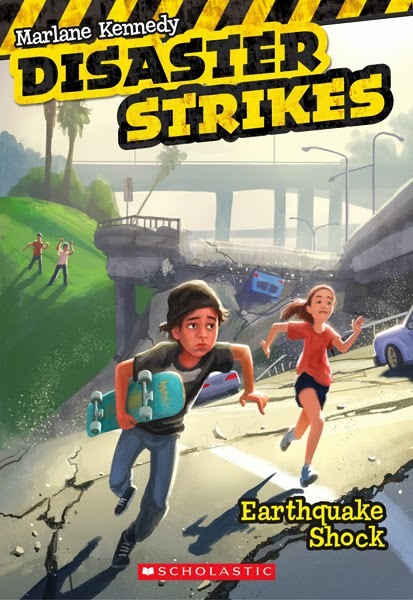 I just got approved for an ARC of the next book (Tornado Alley) in this series also and can’t wait to read and review it! Joey, Fiona, and Kevin are good friends. Joey and Fiona love to skateboard while Kevin loves to make mini movies showcasing their tricks. Kevin wants to be a movie producer when he grows up. One day, Joey and Fiona are at the skate rink when Joey’s mom says something that embarrasses him in front of other kids. She wants him to come home immediately because she has run out of diapers for his little sister. Dylan, a kid who lives next to Joey and teases him all the time, tells Joey’s mother that he’ll walk Joey home in a short while. Joey knows that something is up but he’s just happy that he gets to skate a while longer. The four of them head home a short while later and are up to their usual antics. They are performing and recording skateboarding tricks under an overpass, when a massive earthquake hits. Roads collapse, the overpass crumbles, cars are a jumbled mess and people start panicking. Joey and Fiona escape from underneath the overpass but they cant find Kevin and Dylan. They look everywhere but then realize that the Kevin and Dylan could be under the rubble. Will Joey and Fiona be able to find their friends? Will their families be okay? What if there are aftershocks? Sorry! I just realized I sent that twice! no problem – sorry about the delay in responding. Thank you so much for the nomination. I’ll review and respond this weekend. Thank you for visiting my blog! Great! Excited to see what you write! What is joey mostly worried about after the earthquake? What is joey mostly worried about? Is he worried about his dad?